The nasal septum is the wall separating the left and right nostrils from each other. A deviated nasal septum occurs when the nasal septum is not centered between the two nostrils. A well-centered septum allows equal airflow through each nostril. A deviated septum may cause no symptoms at all. In severe cases, however, airflow through one or both nostrils may be blocked. Nostril blockage may cause chronic stuffiness (nasal congestion) and a tendency to get sinus infections. The doctor will ask about your symptoms and medical history, and perform a physical exam. The doctor will carefully examine the nasal passages using a nasal speculum to hold the nose open. Most people with a deviated septum don't require treatment. In severe cases, surgery may be recommended. Surgery on the septum alone is called septoplasty. 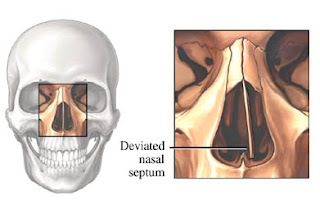 Septoplasty relieves nasal blockage by centering the septum between the two nostrils. Sometimes surgery to reshape the nose (rhinoplasty) is performed at the same time. The two procedures together are called septorhinoplasty. Children who need surgery usually wait until they've stopped growing, around age 16. Since many insurance companies regard septorhinoplasty as cosmetic surgery, be sure to confirm that your surgical costs will be covered before scheduling treatment. • Wear seat belts in automobiles and airplanes.